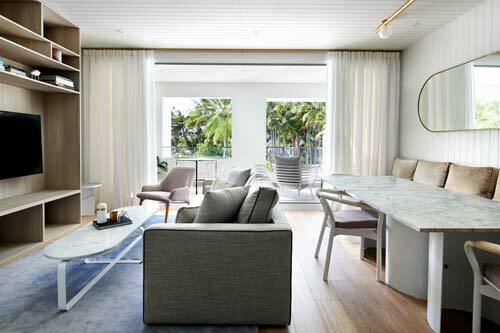 Two steps from the pristine sandy shores of Four Mile Beach sits the prestigious and inviting Sheraton Grand Mirage Resort, Port Douglas. 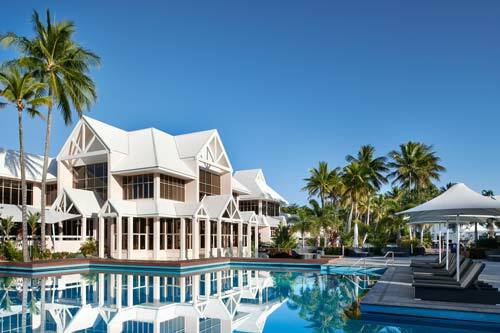 Captivating from every angle, it rises from the sand, surrounded by tropical gardens and saltwater lagoon pools. 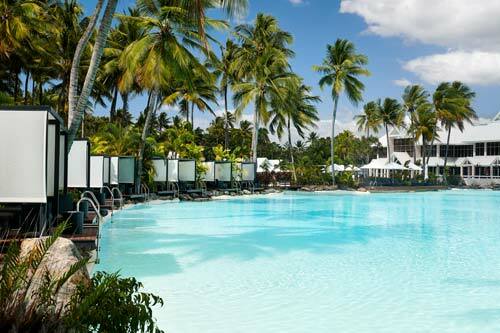 The location offers the best of what Queensland has to offer, and the resort adds luxury to the world-class scenery. With 18 indoor and outdoor venues available, there is ample space for any event. The main lobby will have you gasping at the vaulted ceiling and spacious layout. 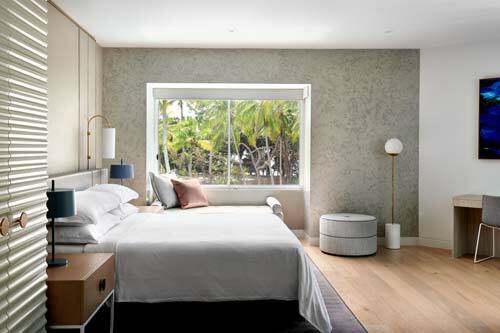 The chic décor is inspired by the golden days of vacating in Hawaii during the 1960s. It is retro, glamorous, and fresh. The café at the centre of the lobby is brought to life with grey marble and offset with sharp, white geometric wood paneling. Throughout the space greenery brings the décor together, softening the luxurious features. The staff are welcoming and full of that famous Queensland friendliness. Living in paradise certainly does wonders. They offer five-star service and cater to your needs with a smile. 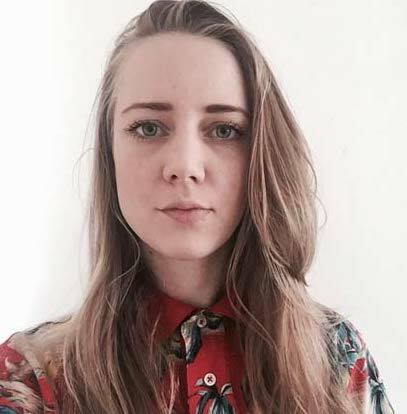 The casual friendliness is a nice relaxing touch that is sure to impress. When luxuriating by the pool grab yourself a cabana for a very reasonable price. It’s an indulgence that is often looked over, but it the added privacy is so valuable on a holiday. Having a private space to lounge is a wonderfully personal touch. If you’ve ever wanted access to a pristine tropical lagoon from your front door, then the Sheraton Grand Mirage Resort has everything you desire. 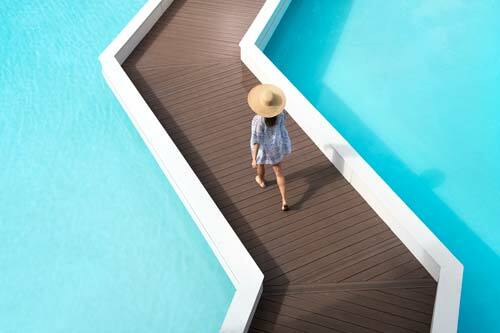 Lagoon Edge Rooms boast swim-up entrances, private balconies and luxury beds that will have you relaxing immediately. The rooms allow for you to create your own tropical paradise, perfect for a romantic getaway. The large beds bring comfort that is unparalleled. You’ll have a night of pure relaxation as you sleep amongst soft linens in the cool air. 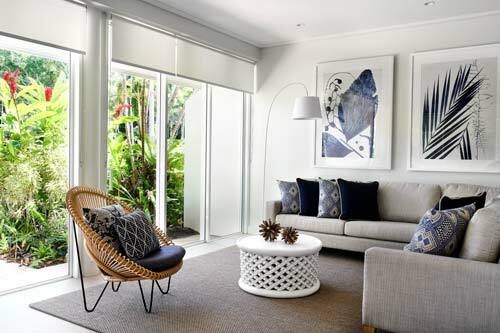 Every room is impeccably decorated with relaxed sophistication. Feast – This restaurant provides the ultimate in modern Australian dining. With access to the freshest seafood in the country, every meal is an experience of its own. Lagoon Bar – Nothing says relaxation quite like having an exotic cocktail by a lagoon. You’ll be living a tropical fantasy as you swim up to the bar to order your drinks. Combine access to a personal cabana with the ability to order drinks at the pool, this resort will have you grinning. Watergate Restaurant – This fine-dining experience is one you won’t soon forget. It’s sophisticated atmosphere and ambient interior sets the tone for the high standard of cuisine. Executive Chef Lee Neate has sourced the best local produce to create an unparalleled dining experience in Port Douglas. This restaurant is a must when visiting the area. This is the place to enjoy seafood in Port Douglas. It could only be fresher if the mud crabs walked out of the ocean and sat down on your plate. It is an understatement to call On the Inlet iconic. It is an institution, and you would kick yourself to miss it. The staff will guide you through the delicious offerings and pair your meal perfectly with the right wine. This really is Port Douglas’ seafood at its best. While staying at the Mirage you will have access to the Country Club and 18-Hole Golf Course. The world-class facility features an aquatic driving range, nine state of the art tennis courts, a lap pool, a gym, and a sauna. Spend the day on the green and appreciate the perfect weather. 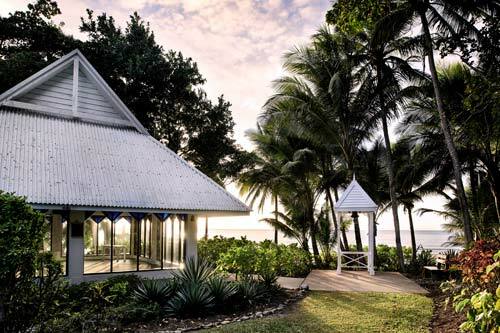 With spectacular sights of the Daintree Rainforest on one side, and breathtaking views of Four Mile Beach on the other, all that Port Douglas has to offer will surround you. If you’re after a romantic getaway or honeymoon spot, look no further. The impeccable 24-hour service from all staff, the swim-up Lagoon Edge Rooms, and the private cabanas all equate to the ultimate vacation with the person you love. 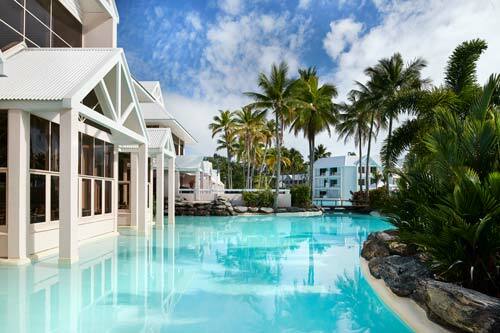 The gorgeous tropical weather that Port Douglas is famous for adds to the luxury experience. Spoil yourself! Book your next tropical getaway here.